William Thomas Blackwell, tobacco manufacturer and civic leader, was born near Woodsdale in northern Person County. His father was James Lipscomb Blackwell, his mother Eleanor Fox Buchanan. W. T., or "Buck," as he came to be called, was the eldest of their twelve children. He received a common school education and also taught briefly, but the necessity of helping his brothers and sisters turned him to trade. In 1859 he opened a store near Roxboro, the county seat. There he dealt in cotton, cotton yarn, pork, and general merchandise. Because of his family responsibilities he did not volunteer for military service during the Civil War; instead, he hired a substitute. In the sixties he began to speculate in plug (chewing) tobacco and to manufacture and sell smoking (pipe) tobacco. With James R. Day, he peddled his products through Eastern North Carolina by team and wagon and set up a jobbing house at Kinston. The most popular brand they handled was manufactured by John R. Green at the hamlet of Durham, twenty-six miles northwest of Raleigh. This brand was named "Best Flavored Spanish Smoking Tobacco," and the package at length bore the likeness of a bull. During the closing days of the war in North Carolina, both Confederate and Union forces reached Durham and many soldiers helped themselves to Green's tobacco. Rueful loss soon became golden opportunity for the owner, however, as orders for "Durham tobacco" arrived in surprising quantity from ex-soldiers in many states. Now in need of partners, Green persuaded Blackwell and Day to join him at Durham. When Green died in 1869, they purchased the business from his estate. The next year, Julian S. Carr bought a one-third interest in the firm. In 1871, Blackwell was thirty-two, Day thirty, and Carr twenty-six, and the assets of "W. T. Blackwell and Company" were approximately thirty thousand dollars. The quality and popularity of the product labeled "Durham Smoking Tobacco," with a side view of a bull on the package, inspired clever and determined imitators. Two manufacturers in Virginia sold brands with "Durham" on the labels, and two in North Carolina used bull's head emblems. Litigation ensued. The stakes were high: Virginia tobacco interests had dominated in North Carolina for a long time and feared their new competition; the Blackwell Company was on the rise and knew that if its trademark were pirated the firm might well fail. The litigation extended over fifteen years before the proprietor of the trademark, W. T. Blackwell, won on all issues—but at a cost of about one hundred thousand dollars. Meanwhile "Bull Durham," as the product was popularly called, became a huge success, rewarding Blackwell several times over what he paid in legal fees. He and Day brought valuable experience in buying, selling, and judging leaf tobacco, while Carr proved to be an energetic and original advertiser. All three seemed to possess keen business sense. To help North Carolina farmers and manufacturers become independent of Virginia markets, Blackwell began the warehouse auctioning of loose-leaf tobacco on 18 May 1871. This was the first step toward breaking Virginia's monopoly and shifting the tobacco industry southward. In the beginning, Blackwell bought most of the leaf himself, but warehouses other than his own, and other buyers, quickly appeared. Spectacular and intriguing representations of the famous Durham bull on billboards, heavy advertising in newspapers, the offering of premiums, and the use of endorsements by well-known public figures made "Blackwell's Durham" familiar all over the United States and even abroad. By 1884 the company's annual manufacture amounted to more than five million pounds; the government revenue tax came to over six hundred thousand dollars. The village of three hundred people in 1869 had become a town of five thousand. The imposing "Bull factory," hard by the North Carolina Railroad, was one of the state's showpieces (National Register of Historic Places, 1974). Its powerful calliope, operated to imitate with amazing realism the bellowing of a bull, rent the air with its time signals and seemed to say daily to Durhamites that their town was one of push, progress, and prosperity and that tobacco was king. Over smoking tobacco, Blackwell reigned, so much so that his main rival in Durham, James B. Duke, decided to concentrate on cigarettes. The 1880s encompassed the heights and depths of Blackwell's career. As tobacco boomed in Durham, he financed the construction of several hundred workers' houses and other buildings. He actively supported the creation of Durham County from parts of Orange and Wake. He helped to promote the extension of railroads from Durham that would connect with lines to the north and south. Most vital in his own mind was the pledge he made after the state supreme court declared unconstitutional the act establishing the town's new graded school: the school committee, he asserted, could "draw on me for the balance that may be necessary to carry on the school as heretofore. . . . it should be sustained." The aid of Blackwell and others, together with legislation prohibiting racial discrimination, guaranteed educational progress. Hiram V. Paul in the 1880s dubbed him "the father of Durham"; William K. Boyd in the 1920s called him "Durham's preeminent pioneer citizen and philanthropist." A brother-in-law of Blackwell, however, stated in a private letter:" . . . he owned the Bull Durham brand exclusively . . . & he sold it for $100,000.00 when he could easily have gotten three to five hundred thousand for it." In 1884, Blackwell launched the state-chartered Bank of Durham, capitalizing it at fifty thousand dollars. This institution financed the operations of many local warehousemen and leaf dealers. Yet Blackwell's sympathy and generosity led him to authorize too many loans with insufficient security. Worse, he and the leading warehouseman, Edward J. Parrish, speculated heavily in leaf tobacco. Their efforts to "bull the market" miscarried, forced the bank to close in 1888, drove a number of businesses into bankruptcy, and brought about the failure of both men. Blackwell's straitened circumstances prevailed for the remainder of his life. 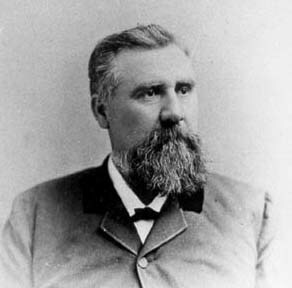 A Democrat, he served as postmaster of Durham under Grover Cleveland's second administration, 1893–97. On 27 Dec. 1877, Blackwell married Emma Exum, whose parents, the W. J. Exums of Hillsborough, were originally from Wayne County. The Blackwells became the parents of a daughter, Mary, who lived only five years, and a son, W. T., Jr., who in later years served as Durham's civil engineer. Blackwell's church membership was Baptist, and he was buried in Maplewood Cemetery. He was survived by his son, two brothers, six sisters, and his eighty-five-year old mother.